They are available in two models, the RTD or Thermocouple version. The PCI773 contains 16 digital input and 16 output ports and 16 differential inputs. The PCI773 has only got one range setting witch is controlled by hardware. The range is calculated and set when manufactured. This gain was designed to give you the optimal accuracy for the application it is to be used for. The PCI-773 is a 16 channel RTD or thermocouple input board. In the same tradition as our ISA-bus board, the PC-73C, the PCI-773 provides the user with a cost-effective solution for measuring signals from up to 16 thermocouple or 16 RTD sensors. No external signal conditioning is required to allow this board to accept these inputs. For external control and/or feedback, the board features 16 digital inputs and 16 digital outputs. These can typically be used for turning on or off items or as an alarm trigger. 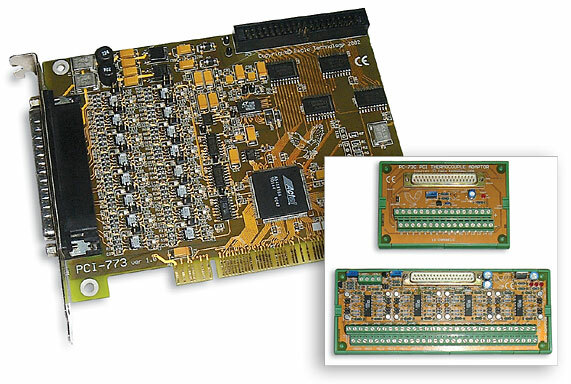 An extremely compact board, the PCI-773 measures and will fit most PCI-bus systems. Boards come included with a screw-terminal adaptor with integrated cold-junction-compensation (CJC) and a 1 meter screened cable. The RTD version also features individual 1mA/10mA current sources. A free windows-based temperature logging application is provided as part of the WaveView for Windows program. Typical applications include temperature measurement for furnaces, cold storage rooms, aquariums and greenhouses.